Great dessert for Memorial Day or the 4th July bursting with flavor and color! Ricotta Cheesecake with mashed blackberry puree poured over the cheesecake...and topped with fresh fruit. A perfect dessert in color for the respect of our flag and what it stands for, freedom. When lush berries are in abundance it's the perfect dessert. You can serve this plain or dusted with confectionery sugar. A wonderful delicious light cheesecake very different than regular cream cheese. You can serve this plain or dusted with confectionery sugar. 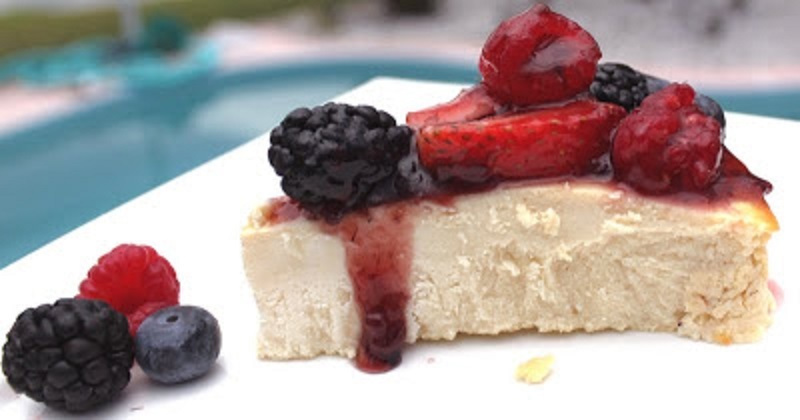 A wonderful delicious light cheesecake very different than regular cream cheese. Preheat oven to 300 degrees . Set rack in the middle of the oven. Butter and flour a 9 1/2 inch spring form pan, and tap out excess flour or if you prefer use a piece of parchment paper cut to fit the bottom. Wrap the entire pan in aluminum foil just around the spring form pan outside, to preserve integrity of the pan..... this is in preparation for the water bath. The water should be no more than 1/4 inch below the top of the foil not above the foil. See above photo. Place the 2lbs of ricotta in a large mixing bowl, and beat it as smooth as possible with an industrial mixer, beat with flat beater for 7 to 8 minutes..... on stir mode. If your are doing this by hand using a rubber spatula it will take at least 12 to 15 minutes. Stir the sugar and flour together thoroughly into the ricotta, beat another 3 minutes. Stir in the one egg at a time until each egg is well blended around 1 minute per egg, beating a little faster than a stir mode. Blend in the flavorings, and salt. Pour batter into the prepared pan it will be medium thickness in consistency not runny or thin. Bake in the center of the oven in water bath about 1/4 inch of water (refer to picture) for about 1 to 1 1/4 hours on 300 degrees, until a light golden color. Cook making certain the center is fairly firm, insert a knife in the center to see if the batter is solid. Cool completely. Chill till serving time. Serve with powdered sugar, a dab of whipped cream or a puree sauce over the top ( any fruit puree cant be substituted). Top with fresh fruit medley. Put berries, sugar, flavoring in food processor pulse puree leaving some chunks, use for topping. A beautiful 4th of July cheesecake! Looks yummy. This looks like a fantastic recipe for 4th of July! This cheesecake is exactly as I like it!! Annette will love this one, she is a cheesecake fanatic. I bet the limoncello really makes this good with the berry topping. So patriotic I think I need at least two slices. When I saw the Limoncello in the recipe I bookmarked it right away! Mama mia-this looks delicioso.I have to make that for my husband-he love s cheesecake. Oh so delicious looking. My cheesecake lover would enjoy this. Berries and Limoncello. Amazing. Great way to use some of the Limoncello in my freezer. Yummy! Oh this cheesecake looks very patriotic. Also no cracks. Total perfection. How terrific I just found this post. I have all the ingredients on hand and I have a pot luck party to go through. Plus I have been wanting to try a ricotta cake (as good as my usual cream cheese cake is, I've had it too often lately). Serendipity! Thank you. wow, I really want to have a piece of this tasty cheescake. By the way, you write a very delicious blog. Keep on this good work! Does it get any better than that? Your cheesecake looks incredible Claudia!!! Just love it! Oh wow! This looks so pretty! All the fruit and the sauce! What a wonderful treat! I love Italian cheesecake and yours looks delicious and very holiday-appropriate. I sure wish it could be made with part skim ricotta, but been there, done that, and it wasn't good.Love the blackberry puree. Give me cheesecake any day! Beautiful and festive dessert! That looks and sounds amazing. Love the use of the berries as well. Yummm!!! Love the limoncello in the ceesecake and of course the three kinds of berries. What a perfect combination! I am suddenly craving for cheesecake. Oh how wonderfully delish. I'm sharing this recipe and your blog with my readers on Monday. hugs!!! By now, you might know how this treat can easily become one of my favs! What a beautiful cheesecake to celebrate the 4th and summer as well! Una vera delizia questa fantastica cheesecake! Bravissima!! !